A college picnic to the beach turned into a tragedy on Monday when at least thirteen students drowned off India’s west coast after they went swimming, police and officials said. The tragedy was the latest drowning incident in India, where many people are unable to swim and lax safety standards mean beaches are often without lifeguards. 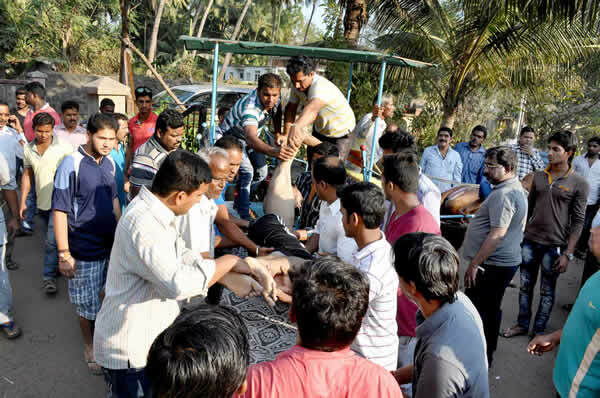 Dozens of students from Pune city were on an excursion to Murud beach in the Raigad district of the western Indian state of Maharashtra when disaster struck on Monday. “A total of 155 students from Pune went to Murud main beach and some of them went swimming around 3:30 pm (1000 GMT) this afternoon,” assistant inspector of Raigad police Arvind Patil told AFP. “Thirteen students are dead due to drowning. The victims were all aged between 19 and 23,” Patil said, adding that 10 women and three men had died. The victims were enrolled at Abeda Inamdar College, an arts, science and commerce institute in Pune. A. Inamdar, a trustee at the college, told AFP that the students had been on a picnic to Murud, which had been arranged by the educational institute. “They were on an excursion and must have gone into the sea against the advice of the teachers. They were swept away by the tides,” Inamdar said. He said that 14 people had drowned, ten women and four men, although police insisted that the death toll was still at 13 late on Monday. Inamdar said all other students had been accounted for while Patil also said everyone else on the excursion was “safe” after a massive rescue operation involving the Indian coast guard and navy. Commander Rahul Sinha, a spokesman for the navy, said up to 18 students had got into difficulty in the water and that six of them had been rescued and taken to hospital. Murud sits on the Konkan coast, which has dozens of beaches popular with locals who prefer it to the internationally renowned tourist state of Goa. Murud is around 140 kilometres south of Mumbai. Inamdar said between eight and ten college staff had accompanied the students on their trip and he had been told that there hadn’t been any lifeguards on duty at the time of the tragedy. “I don’t think there were lifeguards on the beach. That is the basic problem,” he said. In a statement, the governor of Maharashtra, C. Vidyasagar Rao, expressed his condolences to the families of those who died. Monday’s incident comes a few weeks after a man drowned off Mumbai trying to save a girl who fell into the sea while taking a selfie. The girl and two friends fell off rocks into the Arabian sea while clicking photos of themselves. A passerby, 37-year-old Ramesh Walanju, jumped in and helped save the two friends but was washed away by the choppy waters and his body was found floating in a nearby creek. The girl is still missing. In February 2014, 29 people died when a passenger boat capsized in the eastern state of Orissa. A month prior to that incident, 21 people were killed when a tourist boat capsised off India’s remote Andaman Islands.